Left: Before treatment with no product. Right: After treatment with no product. Protein and its importance in our hair routines. Protein treatments help to boost the hair with a variety of nutrients and proteins to help construct and strengthen hair strands. Having a healthy protein balance leads to healthier bouncier curls. Proteins attract water molecules and bond with them. They draw in moisture through the hair and penetrate the shaft to repair any weakness. It is recommended that you do a protein treatment every 4-6 weeks, but if your hair is in need, then more often may be a help to you. The problem with protein treatments is that you run the risk of applying too much to your hair, but we will come to that later. Look out for these next time you pick up a product or hair mask. 1. Is your hair loosing its natural curl pattern? If your hair is starting to lose its elasticity then you could be in need of a protein treatment. This is a sign which could also however be due to hygral fatigue, but if you have any of the other symptoms it will be easy to figure out which one it is. Take a strand of your hair, wet it and try to stretch it. If it bounces back then your hair is balanced. If it doesn't, or it looks limp or breaks, then your hair is missing something and it may be time to get your hands on a protein treatment. 2. Hair flat and stringy? Curls that have started to drop and look droopy and weighed down need protein to be able to bounce back up. Revitalise those curls with a quick treatment. 3. Is your hair feeling a little gummy? As with hygral fatigue, if your hair is starting to feel gummy then the hairs support system is damaged. It is your hairs way of telling you that something is wrong, so pay attention to it! 4. Is your hair dyed? Hair that has been coloured needs more protein than uncoloured hair. Colouring your hair can cause damage to the hairs bonds, and it is the protein what is going to help to repair some of this damage and save those ends from becoming split. As with anything else, there is always a side note disclaimer. Do not go panicking and putting lots of protein in your hair. You can lead to protein overload. Too much good can always be a bad thing. I know this healthy hair stuff is confusing right. You get told to do one thing, and then you get told that doing that thing can be a bad thing. It's all about finding a balance between moisture and protein. Protein overload is when you overload your hair with protein. Remember the article i did on hygral fatigue? (see here) Too much of anything will suffocate and drown the hair strands. If you have protein overload, you will notice that your hair is breaking when you manipulate it. When you are doing styles such as braids and buns, more of your hair is snapping off. The bonds are not strong enough. I think i have this. Is there a way to reverse it? Fear not. Reversing a protein overload will take time, but is easily done. Avoid using protein in your routine. Check the ingredients and look out for the proteins discussed as well as some others. Use a clarifying shampoo to remove any build up. Above are two images of my hair taken on the same day. 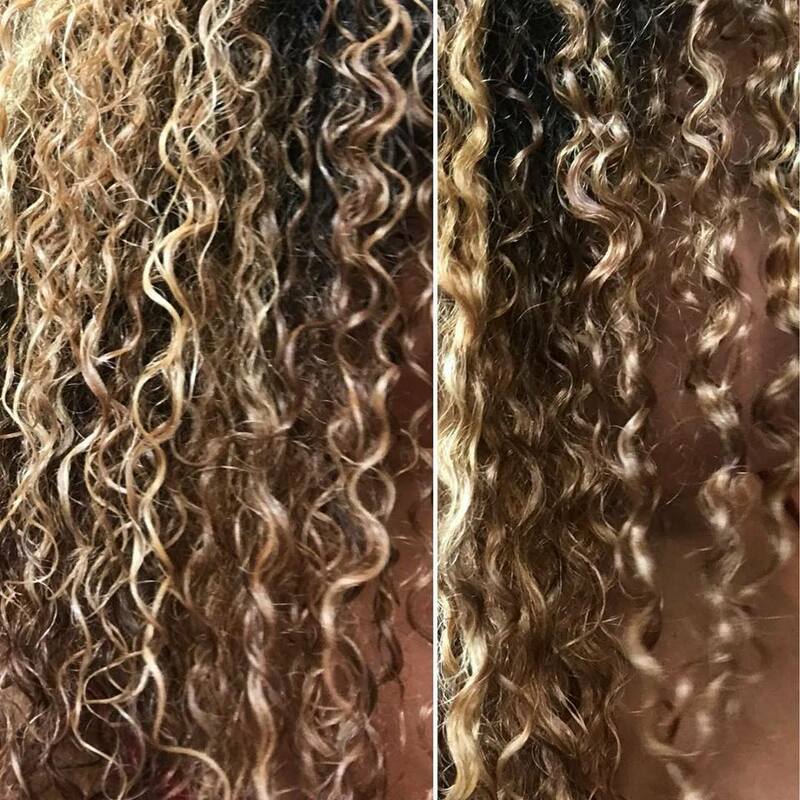 The picture on the left is after washing my hair and before adding a treatment. As you can see my curls are stringy. I knew that my hair needed protein, because when my hair was in a pineapple i had to many straggly ends and my curls weren't bouncing like they used to. This is one of the biggest signs for me that my hair is in need of protein. Another sign that was shouting out at me, was that my curls were looser. Yes this meant that my hair felt and looked longer, but the bounce back in our curls is what lets us know that our hair is healthy. On the Right is my hair after the protein pack. The curls have clumped together more and have more definition, shine and bounce to them. When styling my hair after this photo, i used the praying hands method, and my curls were just bouncing right back. You can clearly see how the strands of my hair in this picture are a lot more together and not splitting and drooping. It looks like i have applied products already. Have you ever suffered from protein overload? Rememeber to follow me on instagram and subscribe for more.